One of a thousand, Mr Peter Kid. A wrestling, weeping, praying Israelite. A son of thunder and of consolation. That he was in the Mount and Peniel. In fixed steadfastness the Rocky Bass. In feeding flocks and kids beside his tent. With his most willing spirit, but fell asleep. His flesh rests here in hopes of future glore. Help Lord, because the godly do decay. Peter Kid was a native of Fife. He was educated at St Andrews University and graduated Master of Arts in 1650. On obtaining his license to preach, he was forcibly inducted into the pastoral charge of Douglas, Lanarkshire, in 1654. Kid was deprived in 1662, but he accepted the Indulgence, and was allowed to become minister at Carluke in 1672. In 1673 he failed to observe the anniversary of the Restoration of Charles II and as a result was fined half his stipend by the Privy Council. In 1677 he again refused to read out a royal proclamation that gave thanks for the king's deliverance from the Rye House plot, and so his indulgence was withdrawn. 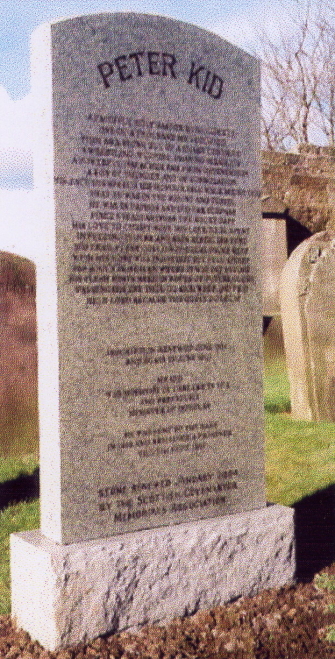 In May 1685 he was imprisoned on the Bass Rock but was released on 21 September 1686, only because of his advanced age and failing health. He then lived at Waygateshaw, near Carluke. 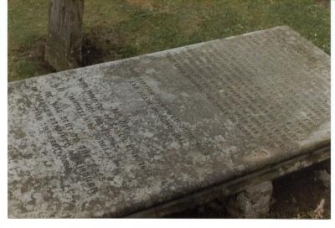 On his death in 1694 he was buried in Carluke parish churchyard, where a table-stone marked his grave. Peter Kid was married to Susannah (who died in March 1697), daughter of Sir John Cheisley of Kersewell. They had four children--John, Elizabeth, Anna and Grizell.